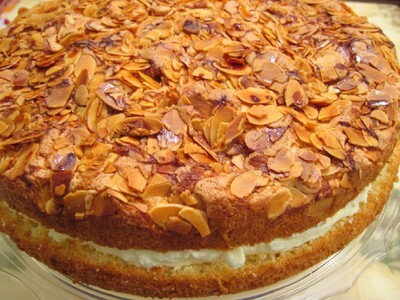 Bienerstich (German Honey Bee Sting Cake)–A little complicated but worth the work. Combine flour, sugar, yeast, salt, lukewarm milk, and butter. Turn out dough onto lightly floured board, Knead until smooth and elastic (about 15 to 20 minutes). Place in a well-greased bowl and cover. Place in warm place to rise for 1 hour or until doubled in size. Punch down dough. Rol out to 1/2 inch thickness. Spread in greased 8 inch round pan. Cover and let rise 30 minutes in warm place. Melt butter and sugar in saucepan. Add almonds and milk. Remove from heat and stir in honey, Spread evenly and carefully over the dough. Cover and allow the dough to rise 30 minutes more. Preheat oven to 400°F. Bake dough for 20-25 minutes or until crust is golden brown. Cool completely on wire rack. Remove from heat and stir in almond extract. Chill, covered, in refrigerator for 1 hour. Beat cream and cream of tartar until stiff. Fold into chilled pudding mixture. Cut the cooked almond crust bread in half horizontally. Fill with pudding/cream mixture. Chill, serve cold.